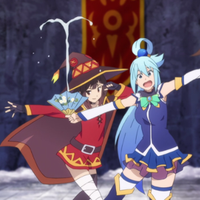 In time for today's release of a new, second OVA with the limited edition 12th Konosuba light novel by Natsume Akatsuki and Kurone Mishima, titled "Female Knight's Lullaby," Kazuma's Jun Fukushima and Megumin's Rie Takahashi appeared on a radio show, on which plans for a new anime project were announced. Format (TV? movie? OVA? ), timing, and other details are to be announced.